Christmas Party Ideas Near Geelong? We’ve Got You Covered. Xmas is coming and everyone’s on the hunt for unique Christmas party ideas near Geelong. Sure, you could book a room at your local pub and do a sit-down dinner – just like last year (ho-hum). Or … why not break-free of tradition and wrap up 2018 with a fun cultural experience no one will ever forget? A unique live music experience, a heritage-laden brewery and a winery with a window on nature’s mastery are just a starting point for all that’s on offer. 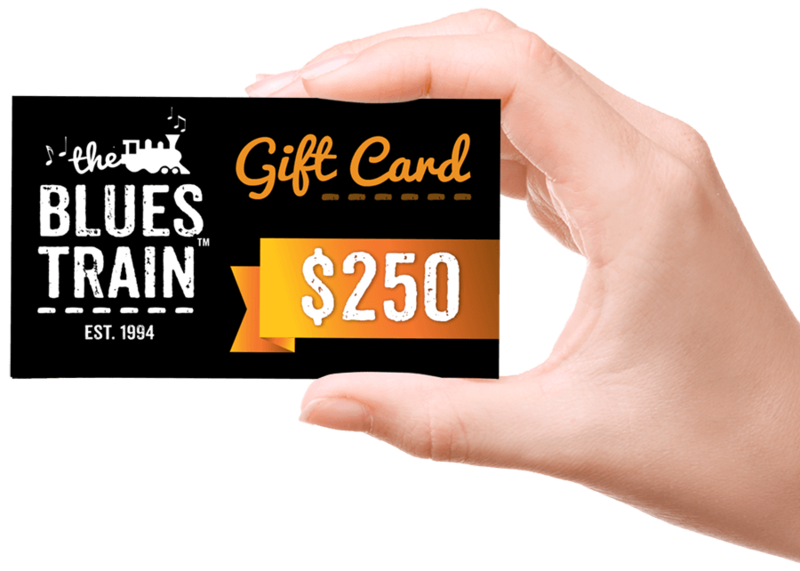 Dial up the culture factor with a live grassroots music experience on The Blues Train. 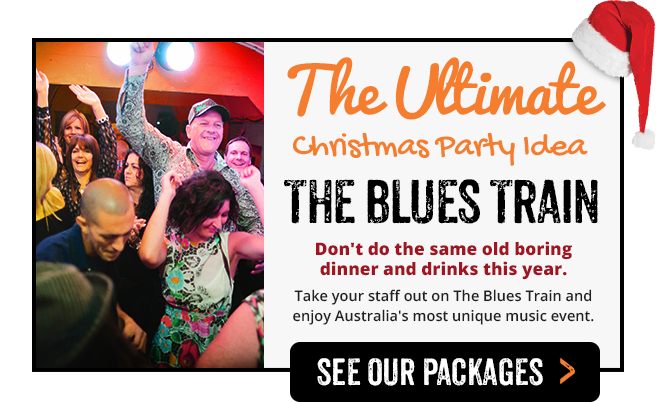 Blues music originated in a mix of work songs, chants, ballads and spirituals – it brings all age groups together and is a perfect match for a night-time work Christmas party idea near Geelong. From Queenscliff to Drysdale and back again. Start at Queenscliff and roll through the Bellarine’s beautiful landscapes on an old-world steam train. Swap carriages along the way to see not one, but four hand-picked blues-loving musicians or bands. Close-up, live and right there with your team in their carriage. A night to please everyone. Dive into our delicious dinner menu, choose from our drinks list featuring local Jack Rabbit wines and Furphy beers (see below). Then dance your heart out – or not. Everyone gets to shape their own Blues Train experience, whether that’s rocking out within a whisker of the artists or quietly toe-tapping from afar. Big groups, small groups, your group. The Blues Train works for all sized groups. Book a whole carriage (or two) for a larger gathering or bring your party of four or six and join a rollicking, ready-made celebration. Each time you switch carriage, it’s a new artist, new seat and new conversation. Mingling, merriment and shared fun are inevitable. Little Creatures Geelong is housed in a heritage industrial mill, where the décor’s big, brick and decidedly rustic. It’s bang-on for a fun Christmas party in Geelong. The staff are lively, the food’s made for sharing and there’s no better place to learn all things beer. Beer brewing is not just for the guys, guys. A brewery tour will have everyone learning more about beer than they ever thought they’d want to know. Afterwards, take your table in The Canteen, and celebrate with a designed-for-sharing food menu and a drinks list featuring (our favourite) Furphy beer and other house-crafted brews. Jack Rabbit Winery – work party lunch with a view to sigh-for. The views don’t get any better than those from the deck at Jack Rabbit, one of the Bellarine’s bevy of brilliant wineries (and a favourite Blues Train hospitality partner). Bundle your office-dwelling team into a mini-bus and enjoy the ride. Make it a long lunch. Set out early and set the mood. Motor through The Bellarine’s rural landscapes, detouring to ogle Queenscliff’s historic main street and modern-day harbour, before settling in for a long, lazy lunch on the winery deck. Kick-back and enjoy your work celebration, while the Jack Rabbit team take care of every detail. There’s room to move, with sweeping lawns and big-sky bay views making the perfect backdrop for a group selfie. Exceptional food and wine are givens. While nature turns on panoramic scenery, the kitchen will serve-up something super-special for your group, and everyone will leave happy. The lead-up to Christmas is one of our busiest times on the Blues Train. If you’re keen to secure a spot for your work Christmas party, check out our line-up of shows and artists over here then get in touch.